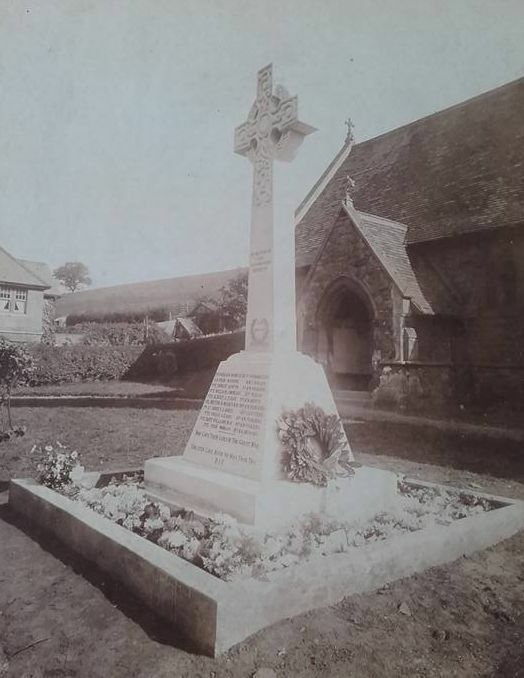 Memories of Redbrook (an extract WW1) - by Mr B Freeman. 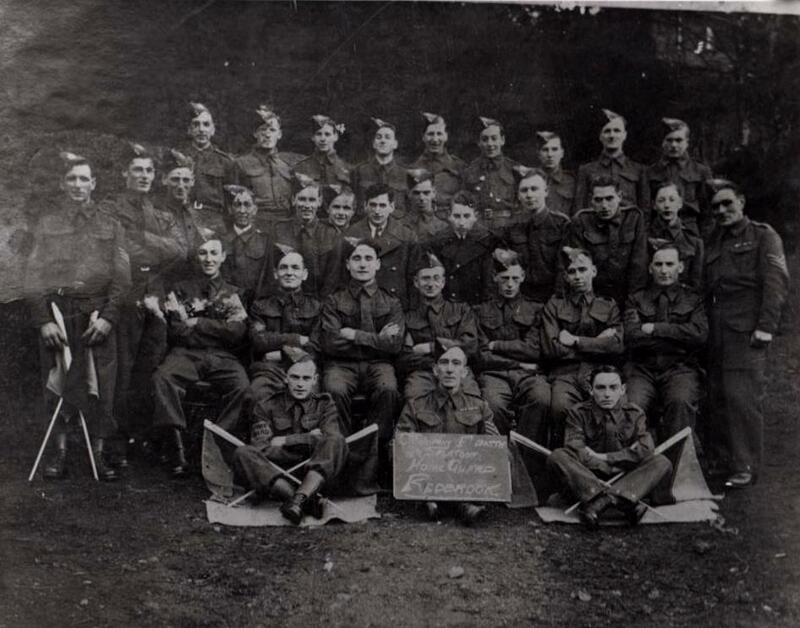 'My first memories of Redbrook go back to the first world war. 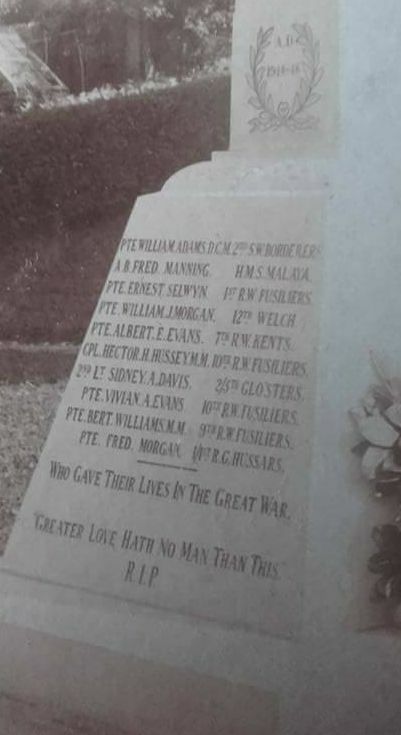 I was quite young at the time but I vividly remember the time when my uncle Peter Saunders was leaving to join the forces in France. My mother took me to my grandmothers to wish him good-bye as he left to catch the train. I remember the sadness of all the family on his leaving us. My next recollection was the occasion of his return home after the war ended. As was usual when one of the villagers returned home safely, the station staff had placed fog-detonators on the line about a mile from the station and as the train approached, the detonators began to explode, thus warning everyone that the time had come for them to make their way to the station. Next Row: Charlie Oliver, Ralph Whitehouse, Les Whitehouse, Doug Lee, George Perkins, Wallace Bevan, Ron Hudson, Viv Whitehouse, Malcolm Hil, Fred Jones, Don Boycott, Wilf Hudson, Les Bevan. Seated: Hector James, Cyril Lee, Jim Oliver, Len Hudson, Alan Whitehouse, Ted Philips, Frank Hook. Front: Frank Perkins, Charlie Phil Potts and Dennis Thomas. In the early days of 18th century, both the Upper and Lower Redbrook Tinplate Works relied on water power from the two streams. 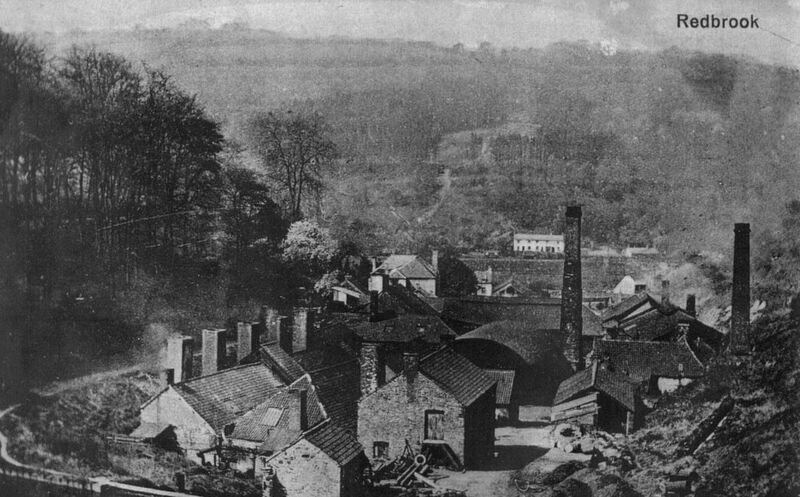 In 1818 the Upper Redbrook Works was demolished and replaced by Redbrook Brewery, and from then on, all tinplate manufacture was concentrated in the Lower Redbrook Works. The success of manufacturing here attracted the building of a horse drawn tram road in 1812. This ran from Monmouth to Coleford with a self acting incline bridge which carried a branch line down to Lower Redbrook, and a spur along to the Lower Redbrook Works and the river wharf. The Bigsweir to Monmouth turnpike road was built during 1823-5 and the Wye Valley Railway in 1876. 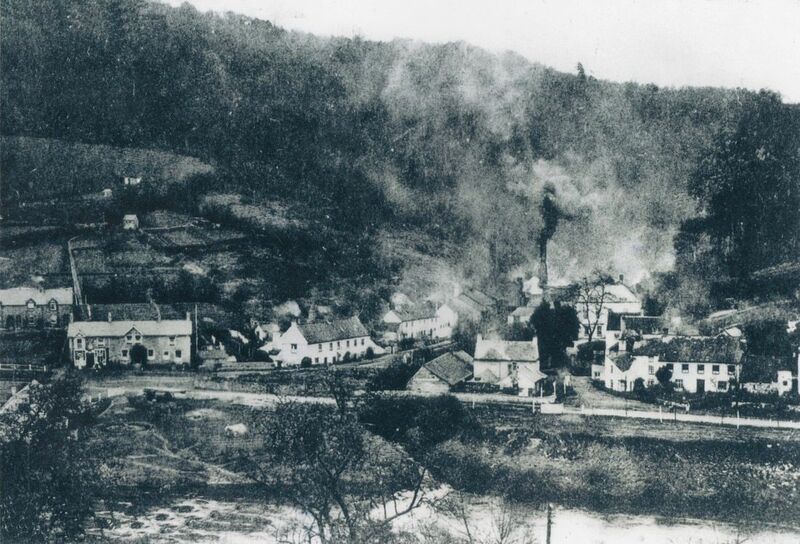 By 1930 Redbrook Tinplate Works had three mills – Big Mill, Baby Mill and Rock Mill, all driven by two massive steam engines which both had separate coal fired furnaces. Before oil fired installation in 1947, the vast quantities of coal required came from the Dean and Tredegar and the tin from Cornwall and Belgium which were all brought by rail. Roller Man – was in charge of his mill. He pushed the red hot steel into the rolls after receiving it from the Catcher and repeated this until he had the required length and thickness. This was a highly skilled job, and every other millman’s wages depended on him. Doubler – received the rolled sheet from the Roller, doubled and sheared it and returned the doubled steel to the Furnace Man. He also relieved the Roller as his deputy. 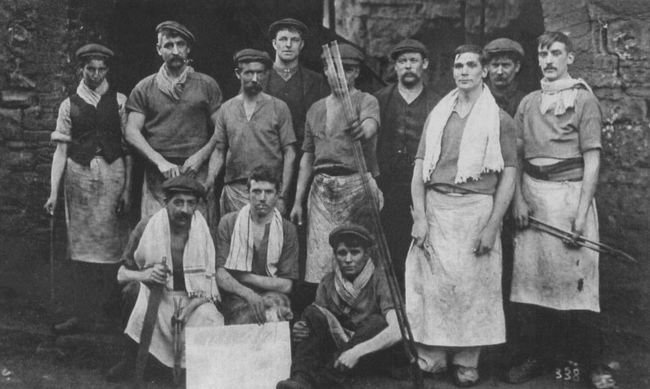 Furnace Man – had care of the two coal fired furnaces and to heat and re-heat the steel sheets. Helper – a young man who relieved every other millman to learn their tasks. Catcher – also a young man whose tasks was to catch the steel as it came out of the rolls and swing it back over to the Roller. 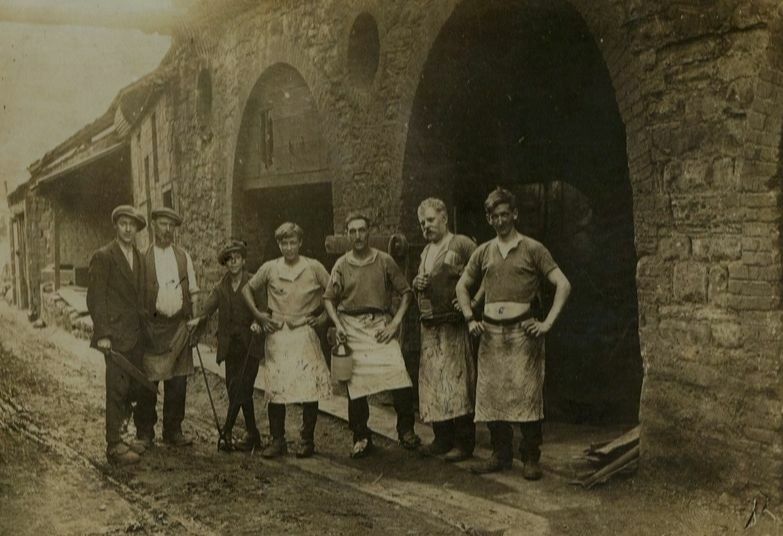 All millmen worked in similar clothes – a white towel around the neck, a short sleeved, collarless waist length flannel shirt worn outside trousers, a long white apron and thick boots. 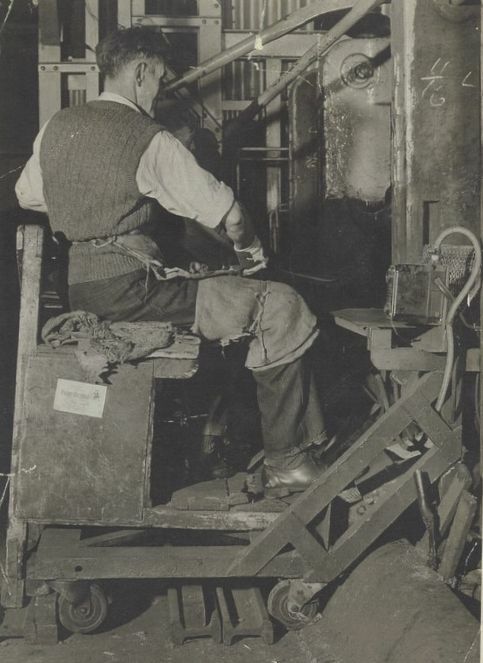 The Doubler also had a steel toecap on his left clog which he used to stamp on the hot steel during doubling. ‘to stand in a rolling mill in full swing was a fearsome experience. The heat, the smell of hot grease and human sweat, the noise of the hissing steam, the clanging of the steel bars passing into the rolls, the glare from the furnace, the sight of red hot bars being lifted and flung across the mill floor from roller to double, doubler to furnace man and furnace man back to roller, the sheer physical effort and concentration involved, all combined to overpower the senses. The next process was to ‘cold roll’ which sealed the surface and gave it gloss. The sheets were then ‘pickled’ by dropping them into a vat of sulphuric acid, then ‘annealed’ and sent to the ‘Tinhouse’ for finishing. Here they were passed through molten tin by skilled Tinmen. Finally, the ‘taggers’ went to the sorting room, where women worked as ‘sorters’ and allocated them from ‘prime’ through to ‘waste waste’. Packed in wooden boxes, the sheets were exported all over the world, from the village railway siding. 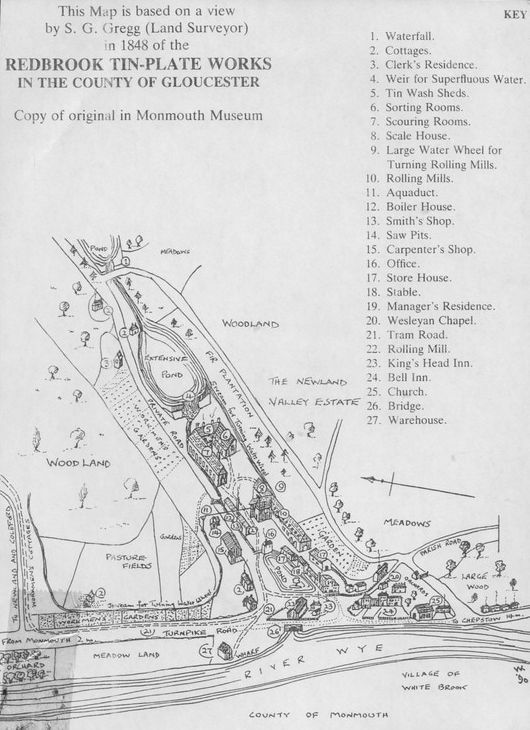 It was the development of the automated strip mills of South Wales that brought over three hundred years of tinplate manufacture here to an end, where at its height the work force had numbered about 500, but had reduced to about 150 when it closed in 1961. Fred Powell 1961 on the "Cold Roll" machine.